Now that summer is here, it sometimes feels like all order has flown out the window. As a work-at-home mom, the summer is often a challenge for us because even though we don’t have the structure of the school year to keep the kids occupied and out of my hair, work has to happen. This is harder in the summer, because there is little to keep us anchored and scheduled. I was thrilled to be selected as a partner for Disney Junior’s FRiYAY program line up, because I’ve found this structured block of family time is the perfect anchor for our loose, summer days. Each Friday, we make sure to tune in to the new Disney Junior programming on The Disney Channel for the FRiYAY morning block from 6-10 AM. The shows airing are Mickey and the Roadster Racers, Puppy Dog Pals, Sofia The First, Elena of Avalor & The Lion Guard). Watching the shows each week at the same time gives us structure to our otherwise chaotic week. I didn’t know this until we started watching the FRiYAY programming, but the FRiYAY block on Disney Channel is where all new Disney Junior shows are first released. Later, the shows are added to the Disney Junior channel. My preschooler, Bo, is REALLY into Mickey Mouse and Minnie Mouse, and she loves all things cars, so her favorite show on Disney Junior right now is Mickey and the Roadster Racers. Racing is one of her favorite things, and she’s always challenging us, her friends, and her sister to race her. As the second child, she already knows that everything is a competition! I love watching Mickey and the Roadster Racers with her because it includes themes that she loves, like racing and her favorite characters. It also gives her important messages about how to be a good sport and how to win and lose with grace. These are definitely messages our competitive family needs to hear. 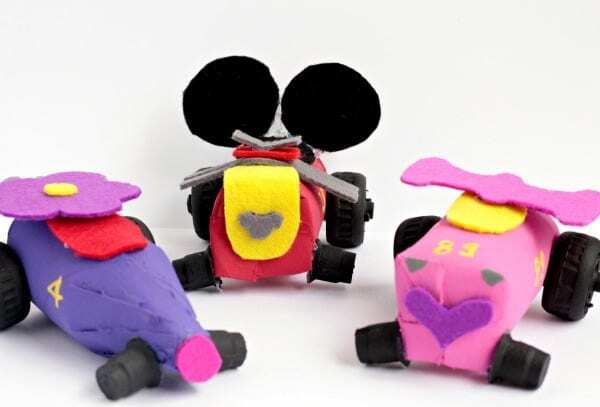 I knew Bo would love having her very own Mickey and the Roadster Racers cars to play with, so I came up with the designs for these cars using recycled materials we had around the house. 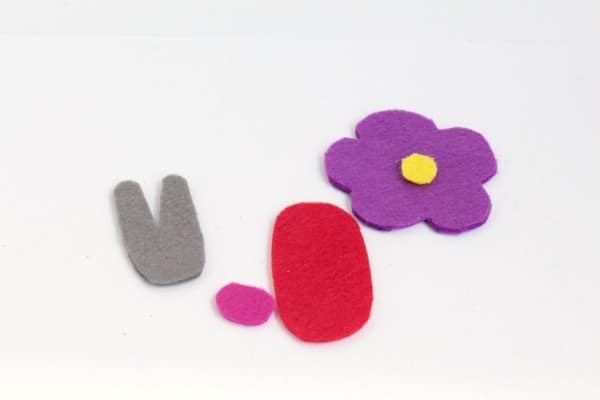 You can follow along with the tutorial below to find out how to make your own! 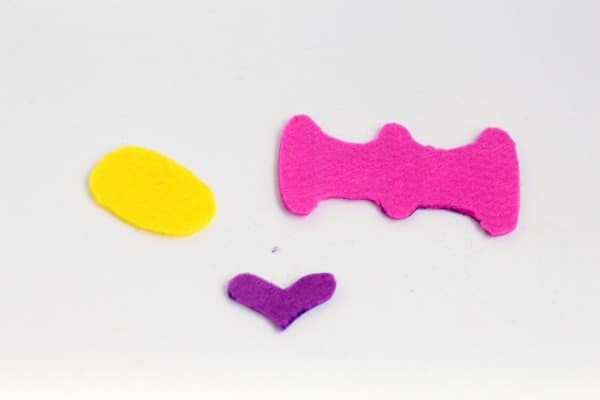 This was one of our favorite craft projects for kids yet! 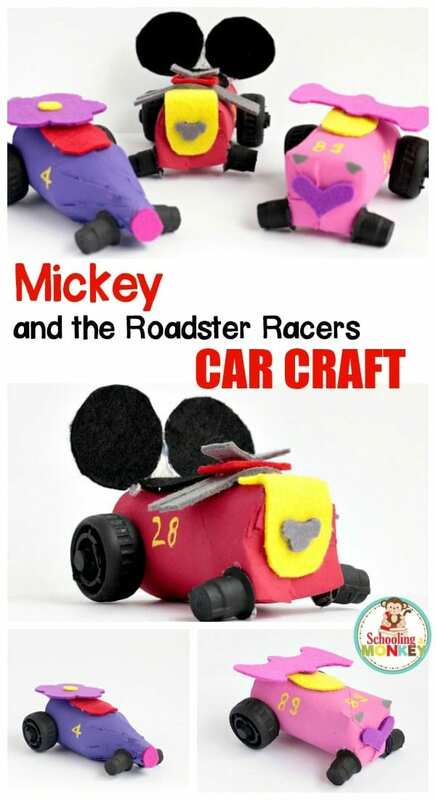 These would make adorable party favors for a Mickey and the Roadster Racers party! 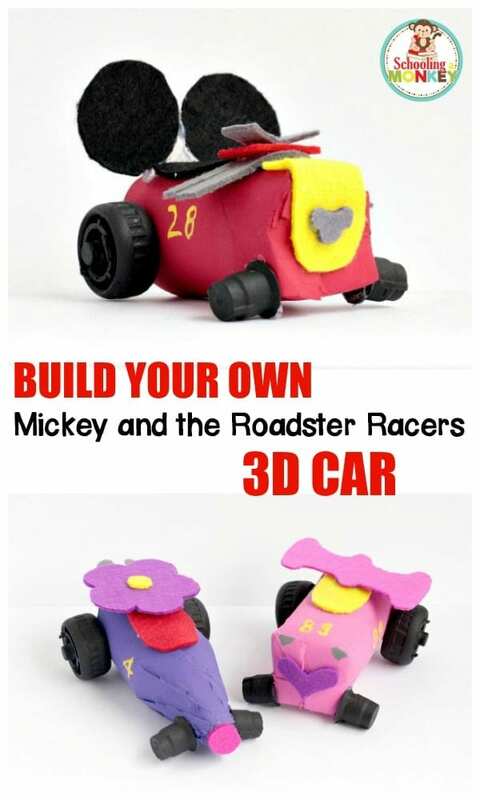 Bo’s favorite Mickey and the Roadster Racers characters are Mickey Mouse, Minnie Mouse, and Daisy Duck, so those are the cars I chose to recreate for this tutorial. 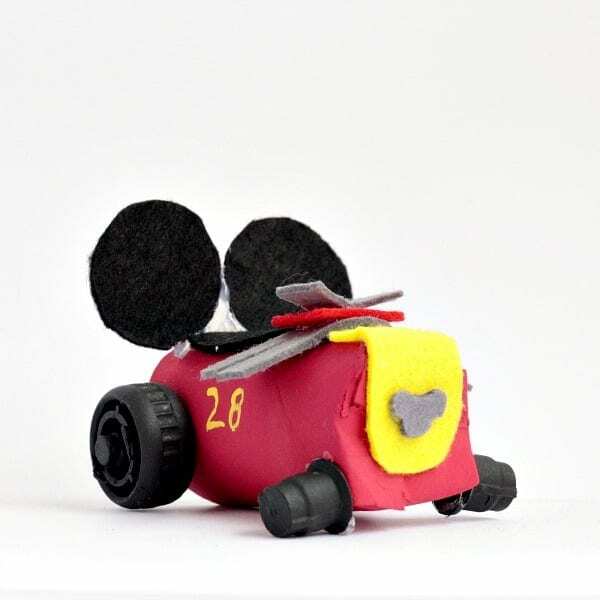 Of course, you can use the same basic instructions to make any of the Roadster Racers cars! 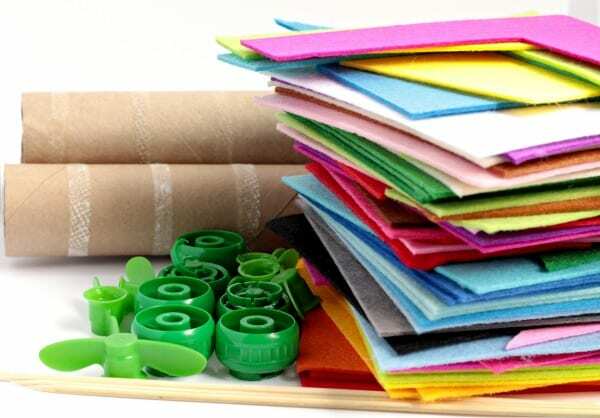 Trim any extra plastic from the pouch lids using scissors or a craft knife. Paint the lids black and set aside to let dry. 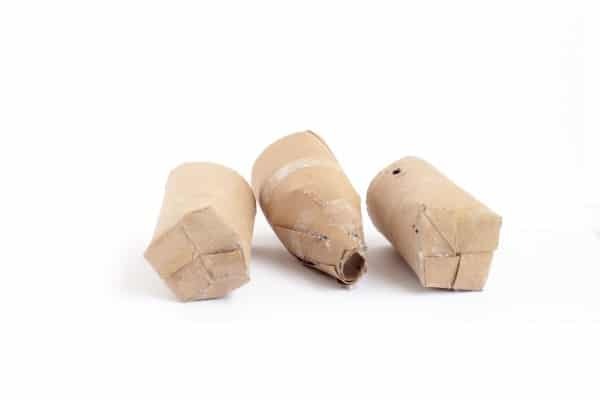 Cut your craft tubes to about 5 inches long. 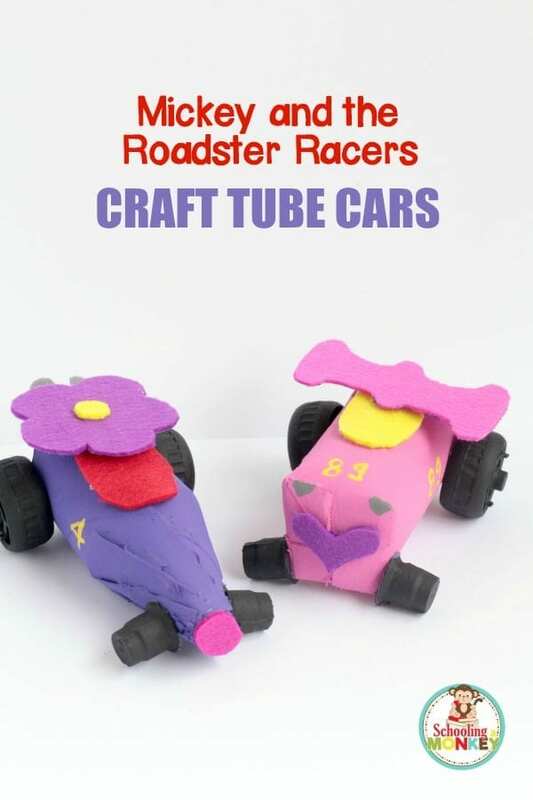 You’ll need one tube for each car. 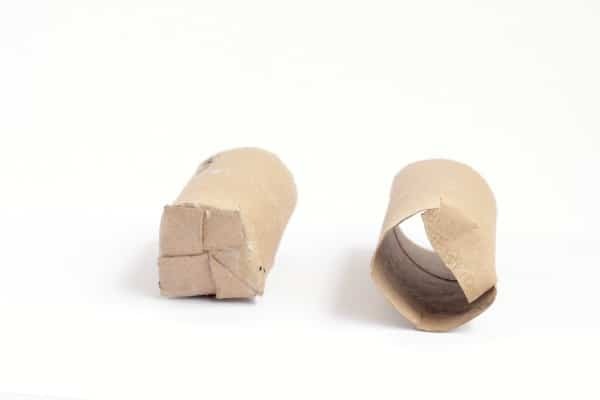 For Mickey and Minnie’s cars, cut four slits about 1 inch long around one side of the cardboard tube. 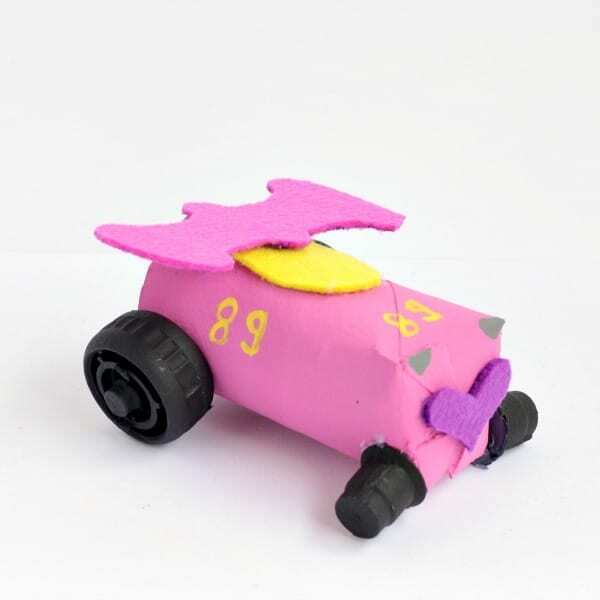 Fold the pieces over each other to make a square, flat front for the car and glue down. Leave the back end of the car open. For Daisy’s car, make about 8 cuts 3 inches long around one side of the tube. Overlap each piece over the next, gluing in place. 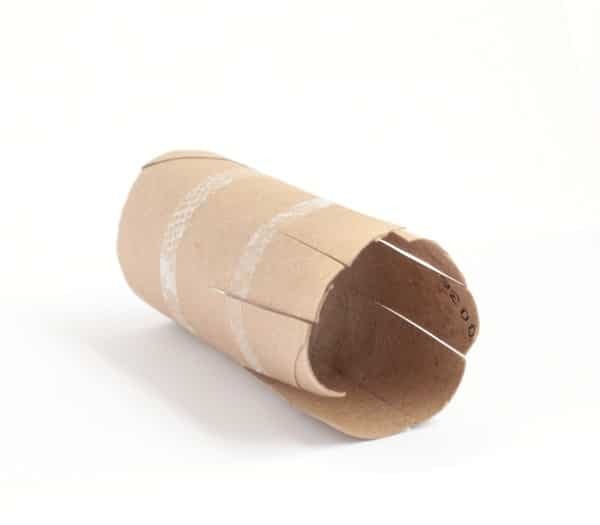 This will narrow the edge of the cardboard tube and give the tube the pointed nose like Daisy’s car has. 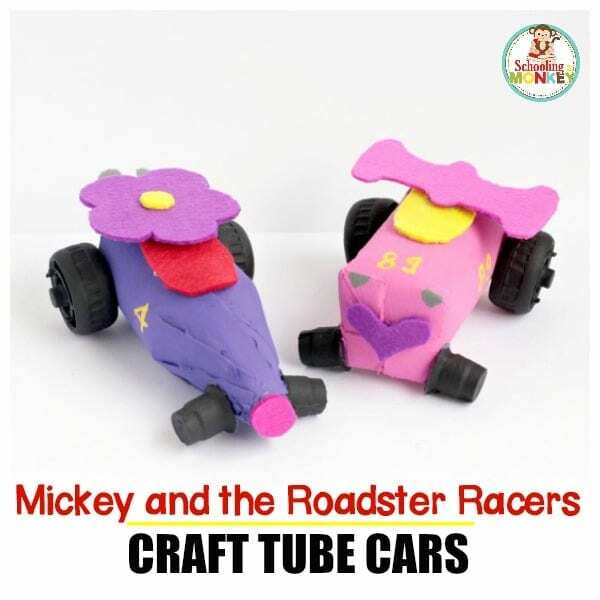 Using pictures of Mickey and the Roadster Racers cars, paint the craft tubes with the color of paint that is the dominant color on that racer. 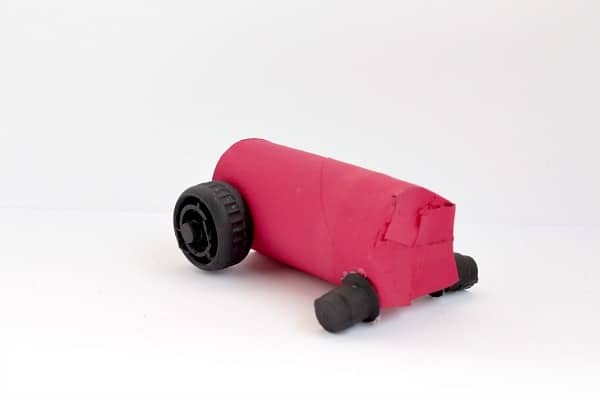 We made Mickey’s car, Minnie’s car, and Daisy’s car, so we had a red tube, a pink tube, and a purple tube. Let the paint dry. 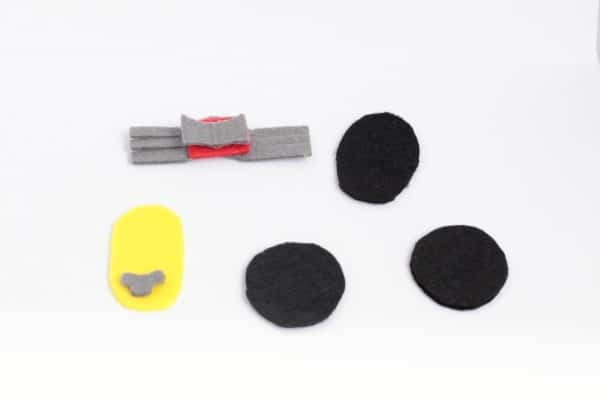 While the paint is drying, cut pieces of felt to make the accessories using the following photos as a guide. 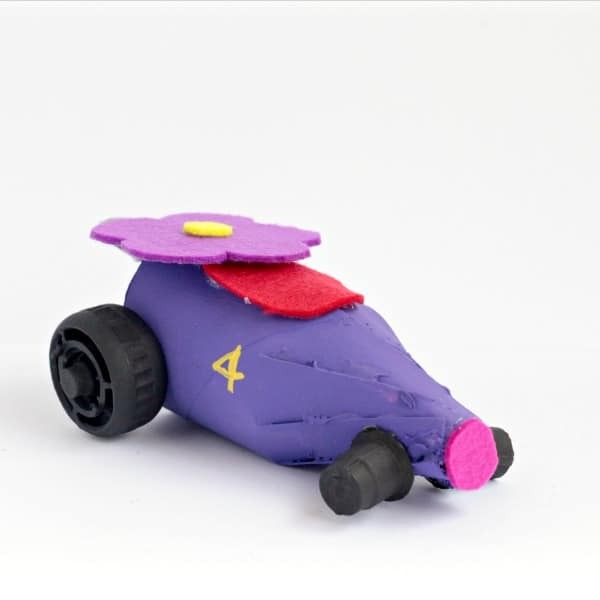 When the paint is dry, glue the felt and the wheels to each car in the correct location using a photo of each Roadster Racer as a guide. Using acrylic paint, paint in the details for each car. Mickey is number 28, Minnie is number 89, and Daisy is number 4. Minnie’s car is also the only car that has headlights. Wait for the paint to completely dry before giving the cars to your preschooler to play with. Bo was absolutely delighted with the cars and she plays with them constantly whether watching Mickey and the Roadster Racers or not. Tune in to the Disney Junior FRiYAY programming on Fridays this summer for all new episodes of these fun Disney Junior shows!